Welcome to the top 6 extraordinary themes of December! I realize for all of you here at iJailbreak, this contest is going to be a new concept for you, but it is a new concept I am excited to introduce. The Top 6 Extraordinary themes contest (or the iJailbreak Exclusive Awards), is a yearly contest that iJailbreak will be holding for WinterBoard themers. Now unfortunately this years contest will be coming to an end, and we will move into the voting stage, but that doesn’t mean the contest is over… If you are still interested in entering a theme into next years contest, please register early as space fills up fast! What is the iJailbreak exclusive awards? The iJailbreak Exclusive awards is a yearly theming contest, that takes the winners of our monthly theming posts (May, June, July, August, September, October, November) and brings them to center stage for you to vote for your favorite theme developer. The developer with the most votes will win $100 cash, and some other cool prizes. This will take place a week after this post has been published, so stay tuned for more details…Now lets get on to this months last extraordinary themes post to finish off the year of 2010! The winner of this months top 6 extraordinary themes contest goes to AnthonyGiola, for his theme Devoured. Not only is devoured extremely detailed, it features stunning handcraft artwork that will shine on any iPhone or iPodTouch! We were extremely excited when we saw Devoured for the first time, and we hope you will feel the same excitement when you check out this truly Extraordinary theme. With a theme so much is possible, that is not with Apple’s stock GUI. 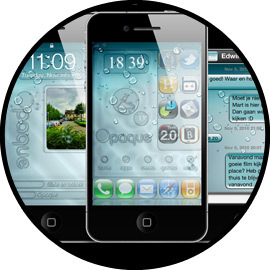 And one theme that takes advantage of WinterBoard is a theme by Retrospect called Realite HD. 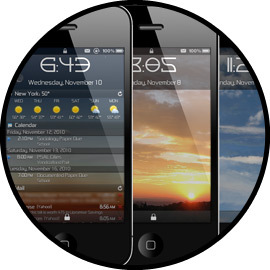 This theme includes advanced functionality like autoskinning icons, weather/time widgets and so much more. 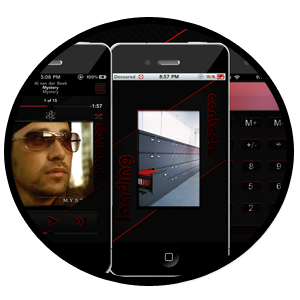 If you are looking for a theme that is elegant yet functional, Realite HD by Retrospect is your best choice. “Wow” is the first word the comes to mind when you take a look at iNitsua Z HD by the expert theme designer Zuasser. Not only does this theme replace every single UI element on the iPodTouch/iPhone, it replaces it in a way that is truly extraordinary. From one jaw dropping animated lockscreen, to some very impressive artwork, iNitsua Z HD will be a theme to show off to your friends. When we saw iMagine by Anonomys, we were very excited to share with you one of the cleanest and sharpest themes we had seen in awhile. Not only does iMagine provide one complete UI overhaul, it accomplishes the overhaul with pride! In fact iMagine completely re-skins your iPodTouch/iPhone’s keyboard, calendar, SMS bubbles, and even comes with auto icon creating functionality. We know you will fall in love with iMagine! For all of you Apple rain drop wallpaper fanatics, you will be pleased to know that there is a theme that mimics this clean and crisp Apple raindrop style! This theme is called opaque, and is being developed by two very talented themers who go by the names of Maarten16 & Ecko66. If you are interested in a theme that is extremely clean, complete and unique, Opaque is the theme for you! This was the top 6 extraordinary themes of December, and will be the last top themes contest of 2010! Next week will be the voting period where you can vote for your favorite theme developer. Please start submitting your entries for next years contest, via our contact page. Will will keep you updated about this, but until then tell us how you liked the top 6 extraordinary themes of December! Note: If you are a developer and have won a top spot on one of this years extraordinary themes contest, you will be notified sometime this week with more details.